Wrapped Up in Books: The Best of Aye Write… | Scots Whay Hae! Glasgow’s festivals continue apace. It’s almost March so Aye Write! must be imminent to let us know that Spring is just around the corner as the big beasts of all things bookish come to Glasgow to talk about their work and themselves. There are old friends and new attendees this year, and while there are less big literary hitters than there has been in recent years, there is a greater variety of types of writers, and plenty of interesting events. Here are my picks of the festival, one (or sometimes two) from each day, and hopefully they’ll include something for everyone. Friday the 4th’s pick is Graeme Garden, and is an example of the diversity this year. He’s bound to be entertaining as anyone who is a fan of his comedy, from The Goodies to I’m Sorry I Haven’t A Clue will attest to. Garden will be reminiscing about ‘The Goodie’ years, so for a generation or two the warm embrace of nostalgia is guaranteed. He also appears on Saturday the 5th with fellow Radio 4 comedy panellist Barry Cryer, but unfortunately that’s already sold out. .
On that Saturday I would suggest going to hear writer and comedian Des Dillon if you want some filthy humour delivered with an author’s turn of phrase and eye for detail. If you are worried about your sensibilities then The Guardian‘s cartoonist Steve Bell is a perfect alternative, or accompaniment, depending on how much you intend to cram in. 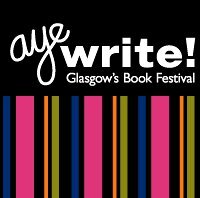 Sunday sees some Scottish writer’s who would all be worth attending. Jackie Kay’s event is another already sold out, but if you like your crime writers then Val McDermid is one of the best. But my pick of the day is an event which sees poets Diana Hendry and Hamish Whyte appearing together. Having heard Hamish a few times I can only say that anyone who attends is in for a treat. Tuesday: The highlight of the day is a straight fight between Francis Wheen and Kevin McNeil. Not a particularly fair fight if I think about it. McNeil will be talking about one of the best novels of last year, his The Method Actor’s Guide to Jekyll and Hyde, while Wheen looks back to the 1970s which he labels ‘The Age of Paranoia’. If you held a gun to my head, I would say go to McNeil, but please don’t put that to the test. Wednesday: Sarah Brown’s appearance is sold out and the only other person who catches my eye that day is journalist Gary Younge who is going to be tackling personal identity, religion, nation, race and region. So nothing too heavy then. Thursday: There are events which feature novelist Rodge Glass, TV historian Niall Ferguson, actor Christopher Stevens talking about the life of Kenneth Williams and a night from DisComBoBulaTe where comedy meets poetry, and which features Michael Redmond, Arnold Brown, Alan Bissett and Magi Gibson. But the highlight of the day will be philosopher John Gray who will, as usual, ask all sorts of questions concerning existence that will wake you up in the middle of the night. Friday: And we’re almost done. If you want end of the week entertainment then it has to be Christopher Brookmyre and Billy Franks. For thought provoking political chat head to Polly Toynbee and David Walker, and if thespian reminiscences are your thing then it has to be John Cairney. I’ll be off to bed early as tomorrow I want to look my best. Aye Write! is an important date on the festival calendar, and with rumours of funding difficulties, I hope such problems can be swiftly overcome. It’s a good sign that many shows are already sold out. My only real bugbear is a selfish one. I think the programme could have been set out with a little more care. I can’t see Alasdair Gray and Iain Banks for example, and there are other clashes of what I would describe as similar events. Of course this is inevitable to an extent, but I think some of the more obvious clashes could have been avoided. On the other hand, the fact that so many top names are willing to come to Glasgow in March is a healthy sign. As usual events will take place in the Mitchell Library starting from the 4 March and continuing until the 12th. You can make your own mind about what to see by going to the official site which you can find here www.ayewrite.com. Tickets are usually £8 (£6 concessions).